I don’t know about you but I just love the farmhouse decor style! However, when you look at some of the prices online and in stores, it can be pricey. 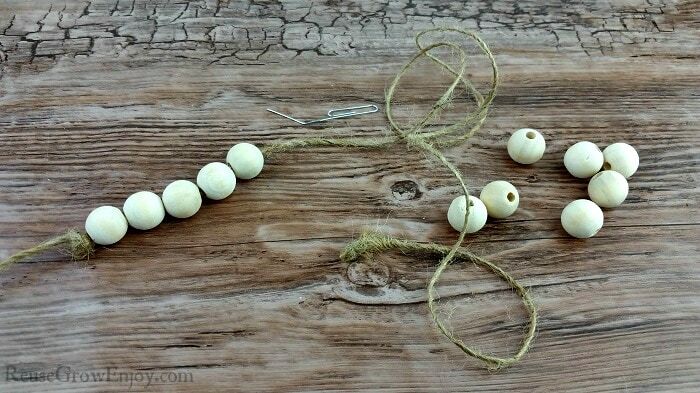 That is when it comes in handy to make things on your own like farmhouse beads. 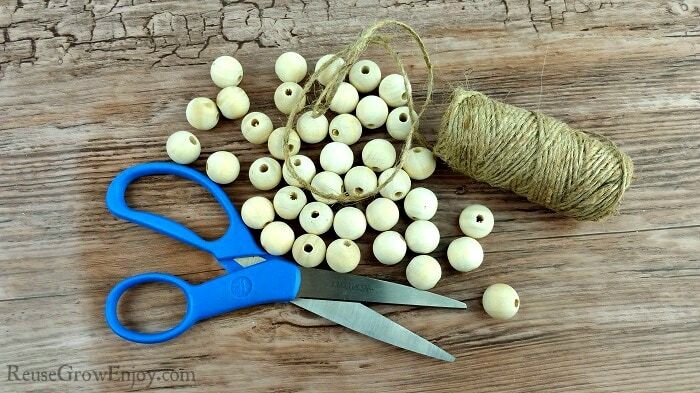 While you could buy pre-made bead decor like this, I am going to show you how to make this cute farmhouse decor with some twine and wood beads. 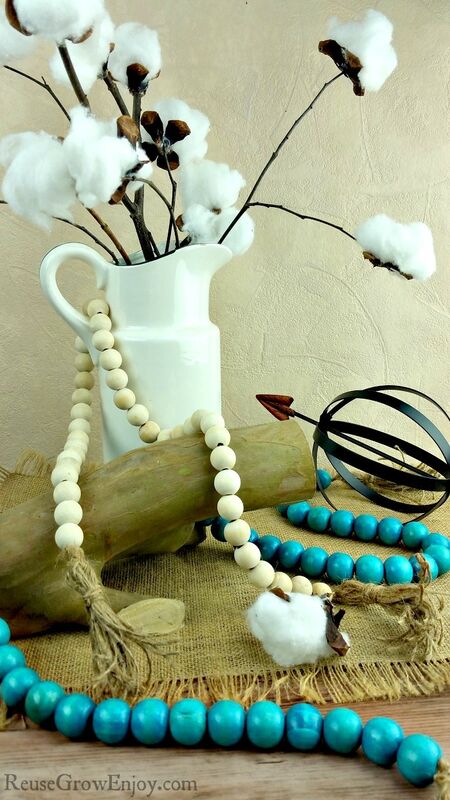 Depending on the look you are going for with your farmhouse beads, you can either do them with natural unpainted beads or get colored beads. I did one of each in two different size beads. 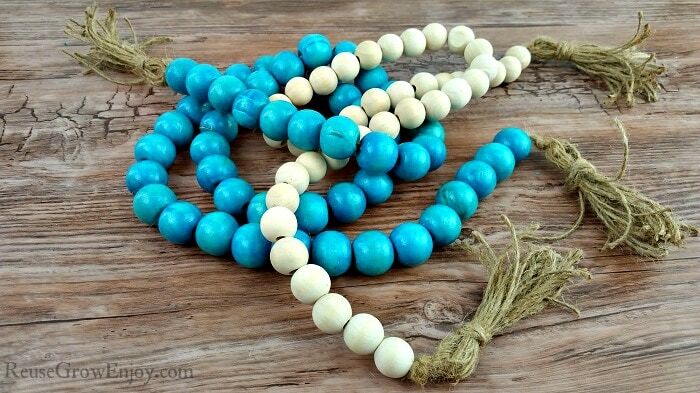 Oh, if you have one of those wooden bead seat covers for cars that is maybe no longer good for the car, you can reuse the beads from that to make one of these! 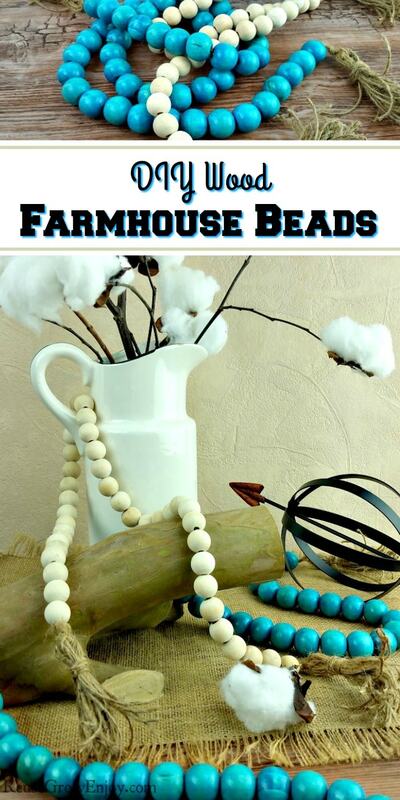 How many beads you will need will depend on the size bead you are using and how long you want your farmhouse beads to be. I have noted what I used for each of mine and how long they are to give you an idea. My natural one is 24 inches long without tassels and 31 inches from end to end including tassels. The blue one is 39 inches without tassels and 46 inches from end to end including tassels. The first thing you want to do is tie a knot at the end of the twin. Be sure to leave a few inches past the knot area as you will need this later to tie on the tassel. 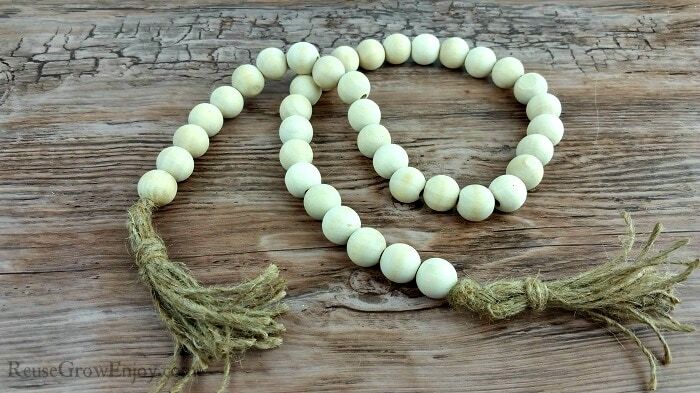 You need the knot to be large enough that the bead will not slide past it. I double knotted mine with one knot right over the other. 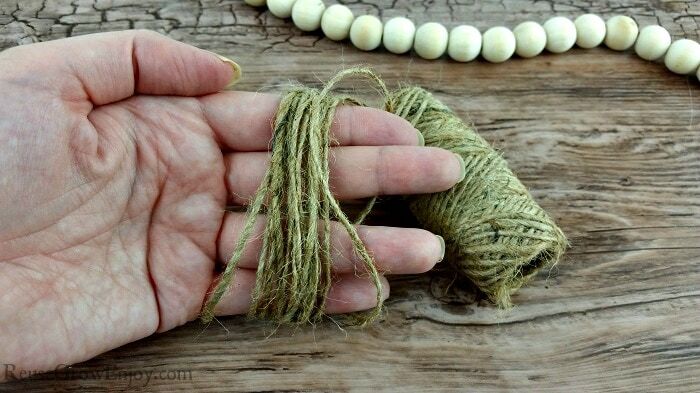 Then unravel enough twine that you will need and cut it from the spool. 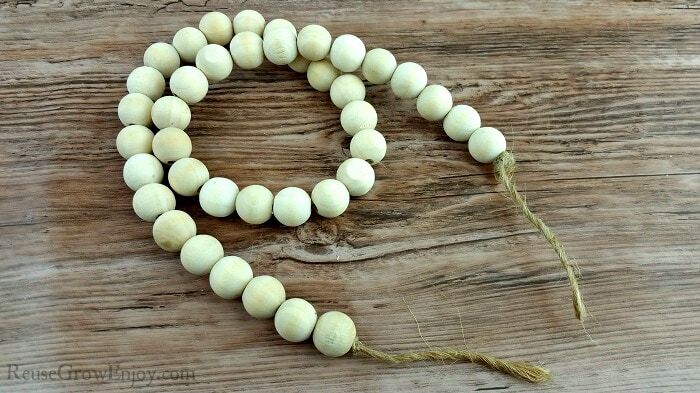 You will need enough to have all your beads on it and also have another tail on the other end with a knot on it as well. Next start sliding the beads on to the twine. 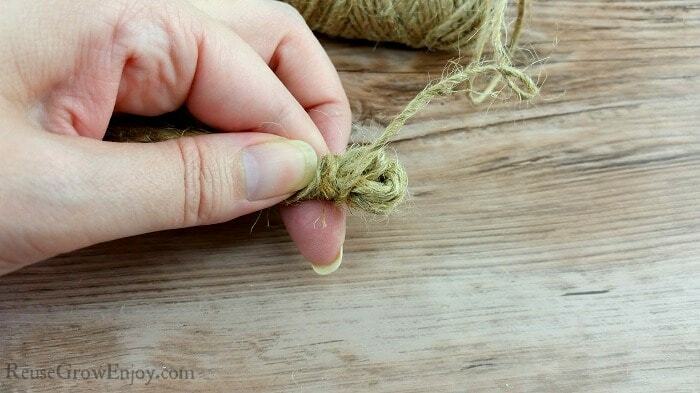 To do this, I found it helpful to have a paper clip to help push the twine through the hole. 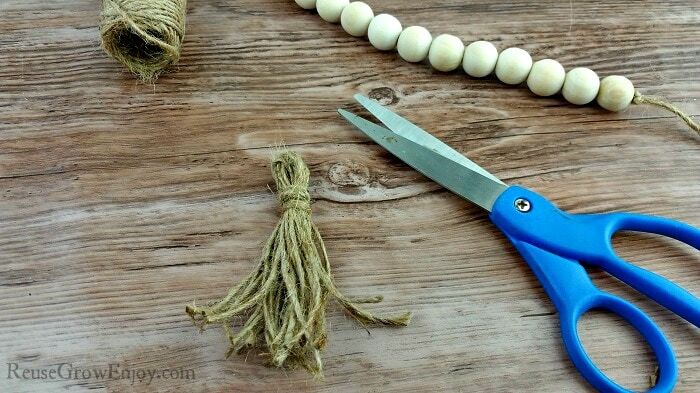 After you have all the beads on the twine, you need to tie a large knot at the end. 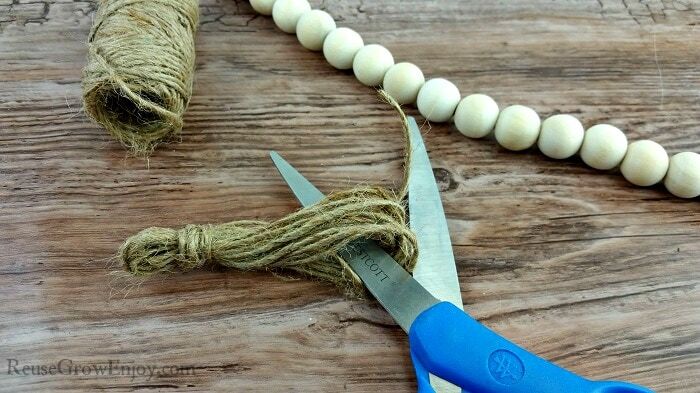 Just be sure to leave a little space so the beads have a little play on the twine. This allows it to bend more easily. 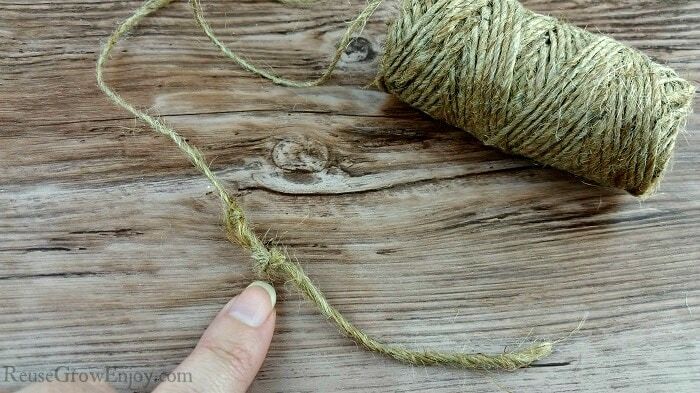 Next take the spool of twine and wrap it around your hand about 15 times. Carefully slide it off your hand and pinch one end together about a half inch from the end. 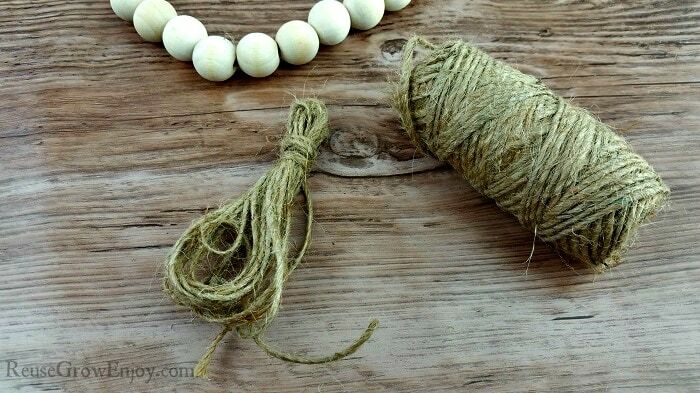 Then take the twine and wrap it around it 4 to 5 times and tie it off to hold it in place. Now you should have a tassel that looks like the picture above. Take your scissors and cut the ends of the loops on the long end. You may have to trim a few off to make them about the same length. Your finished tassel should now look like the picture above. 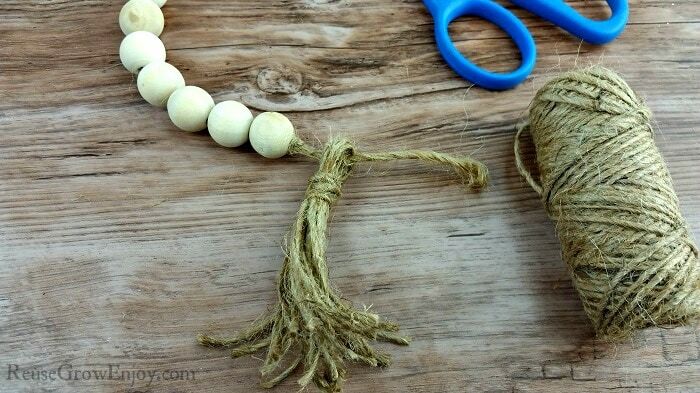 Next, slide the tail of the end of your farmhouse beads through the top hole in the tassel you just made. Using the tail to tie it in place. Then you can cut off any of the extra part of the tail after it is in place. 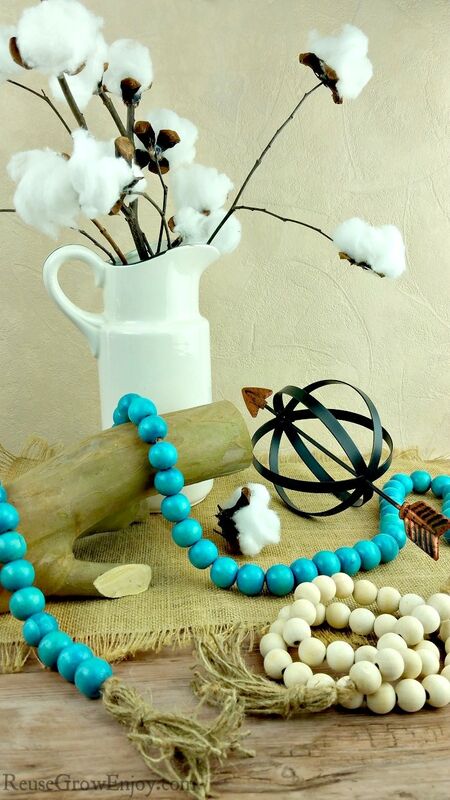 You now have a super cute farmhouse decor of farmhouse beads! Drape it over a vase, books, wood or whatever you like to display them. If you liked this DIY farmhouse decor, here are some others to check out.